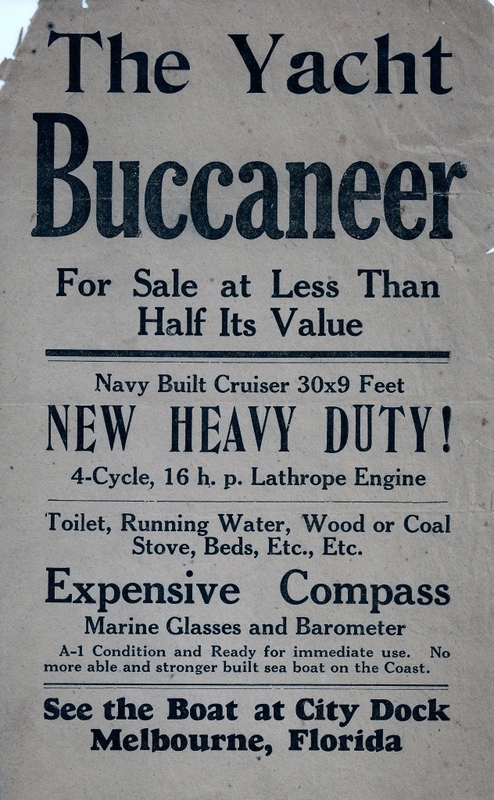 An advertisement for the sale of The Buccaneer, a yacht owned by Captain Charles Henry Coe (1856-1954). The Navy-built 30-by-9 foot, 5-ton cabin cruiser included a 4-cycle Lathrop engine and was docked at the city dock in Melbourne, Florida, at the time that the ad was published. Capt. Coe spent 20 years traveling the Florida coast in The Buccaneer. This advertisement was first posted in 1932, but the yacht was not sold until 1942. Capt. Coe's next boat was called The Buccaneer II. Coe was born in Torrington, Connecticut, on February 3, 1856, to William Henry Coe (1824-1879), who founded the town of Glencoe, and Deborah Little Archer Coe (1824-1912). In 1874, his family migrated to Jacksonville, Florida, due to his father's poor health. At age 18, Coe began working for the Jacksonville Tri-Weekly Union. In 1875, Coe moved to New Smyrna Beach and started his first newspaper, The Florida Star. Coe was appointed Deputy Collector of Customs for the port at New Smyrna in 1879, after his father died. In 1880, Coe moved to Glencoe and began producing photographs. Seven years later, the moved to back to Torrington, where the met and married Emma Sophia Johnson (1846-1931). The following year, Coe moved to Asheville, North Carolina, and then later to Highlands, where the established The Highlands Star. In 1889, the moved to Washington, D.C. to work for the Government Printing Office (GPO). Coe published Red Patriots: The Story of the Seminoles (1898), a book about the plight of the Seminole tribe. A copy of Red Patriots was given to every member of Congress, which later passed legislation allowing Seminole land rights in Florida. In 1912, Coe returned to Florida and spent the next 20 years traveling the coast in his cabin cruiser called The Buccaneer. After retiring from the GPO in 1921, Coe spent much of his time exploring Florida's coast as an amateur archaeologist and publishing books, including Juggling a Rope (1927) and The Art of Knife Throwing (1931). He died of pneumonia on March 23, 1954. Original advertisement: Private Collection of Andrew M. Foster. Copyright to this resource is held by Andrew M. Foster and is provided here by RICHES of Central Florida for educational purposes only. 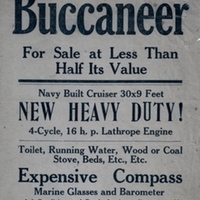 “The Buccaneer Advertisement.” RICHES of Central Florida accessed April 18, 2019, https://richesmi.cah.ucf.edu/omeka/items/show/6198.